Little girls always have and always will have a fascination with certain things. Unicorns, fairies and princesses all lie in that believable yet magical realm of existence which every girl aspires to. Little girls also love to play dress up and let their imagination run wild. 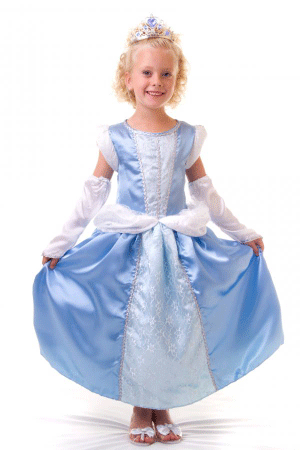 The Princess Dress is a company that helps foster your child's "princess wishes" by carrying anything and everything a royal young lady needs to play princess properly. 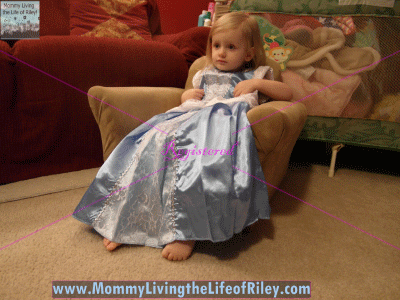 I had the opportunity to review the Cinderella with Glovelets Dress with Riley. Keep reading to see what her highness thought of it! 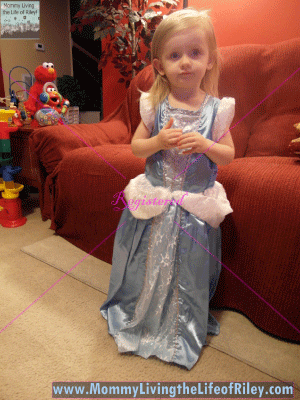 I reviewed the Cinderella with Glovelets Dress from The Princess Dress, which retails for $29.99. I was very impressed by the large variety of affordable princess dresses from The Princess Dress. They had some very elaborate and beautiful designs, most of which cost around $20. I also loved how they had every fairytale character and Disney princess dress in their selection, so your little girl could definitely have her pick of any dress she'd want. Cinderella is probably the quintessential fairytale and my own personal favorite. I thought that the satiny blue color of this dress was gorgeous and the white glovelets were adorable. Riley wanted to wear this dress as soon as she saw it and actually didn't take it off until she went to bed, so I guess it was comfortable too! This Cinderella dress has so many elegant touches, such as the silver rickrack trim and shimmery lace panels. I thought Riley looked like such the little lady in this Cinderella dress, that I can't wait to complete the outfit with tiny heels and a dainty crown. The Princess Dress not only sells the dresses your little girl will want, but every accessory to complete the look too. If you have a girl who would love to be "queen for the day", then head on over to The Princess Dress and get her the entire ensemble. The great news is that these dresses and accessories are so affordable that you won't need to have a royal bank account to afford the fairytale life this Christmas. Disclosure: I received the Cinderella with Glovelets Dress from The Princess Dress in order to facilitate my review. No other compensation was received. This product review is based on my own personal experiences with this item and is completely honest and objective.